Developed in partnership with the Centers for Disease Control and Prevention, Epi-Ready is a two-day in-person workshop for environmental and public health professionals with responsibility for investigation of foodborne illness outbreaks. 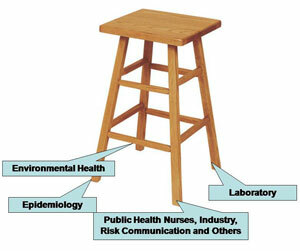 With a team-based approach to training, Epi-Ready focuses on how to efficiently and effectively respond to an outbreak by understanding the roles and responsibilities of the disciplines involved—using the analogy of the 4-legged stool. What happens to a stool (investigation) if one leg is broken or missing? For more information on Epi-Ready Team Training, please contact programs@neha.org. "Ongoing conversation and collaboration between the epidemiologist and environmental health professionals has resulted directly from the workshop." "Our district is restructuring our epi response team to include a dedicated foodborne outbreak "sub-team" and will construct district policies and procedures specific to this team." "The workshop was excellent and the class helped the sanitarians that attended have a better working relationship with nurses and the different roles each would have in an outbreak of a foodborne disease. As a nurse it helped me have a better understanding how sanitarians felt and their responsibilities and roles."